Crowdtap is an awesome website that allows you to earn points for gift cards and freebies by interacting with your favorite brands. Crowdtap is easy to join– you just connect through your Facebook account and within minutes you can be answering polls and questions to help your favorite brands and products better serve you. Recently I was provided with a fabulous opportunity from Crowdtap which prompted me to tell you why you should join again! 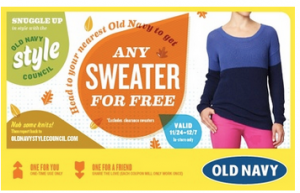 Crowdtap provided me with 2 FREE coupons for Old Navy Sweaters- one for me, and one for a friend. EACH COUPON was good for: 1 FREE sweater of my choice. 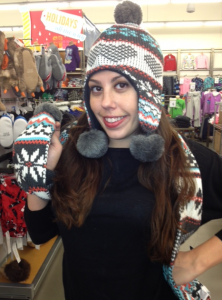 My coupon saved me $40 on the sweater I picked out and I had a ball spending it! 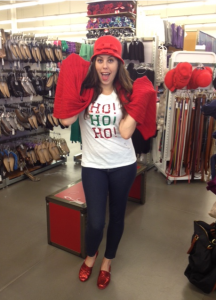 You can check out more pictures of my shopping spree on Twitter HERE! As if that weren’t enough fun, they actually put points in my account for reporting back to them about the awesome shopping experience I had! The points are redeemable for fun goodies like Amazon.com gift cards! If this sounds like something that would interest you, you can join ME on Crowdtap HERE and start earning your own rewards NOW!